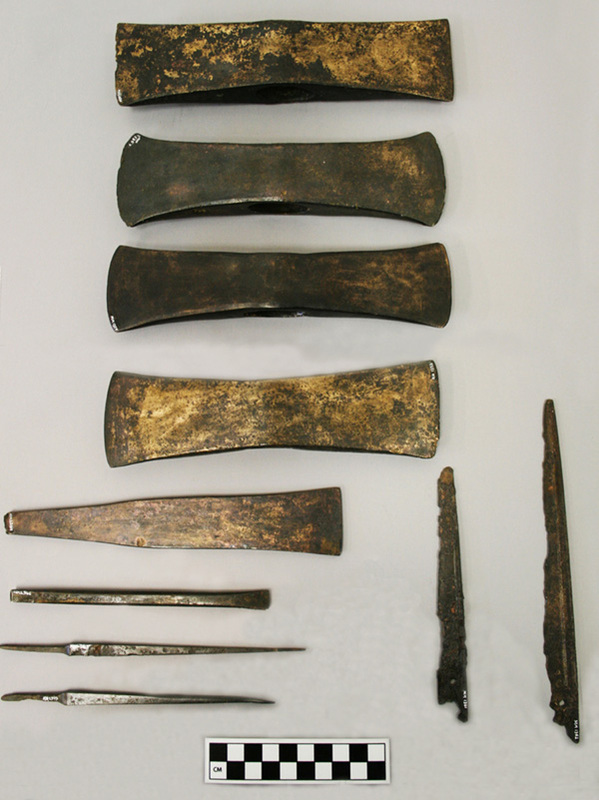 This paper considers the Mycenaean metallurgical industry at the end of the Bronze Age through analysis of metal hoards and the tools found within them. An overview of second-millennium hoards from Crete and the Greek mainland is presented to contextualize the various objects from these assemblages. Patterns of implement inclusion reveal a repeated tool grouping in seven Mycenaean hoards, most associated with elite contexts. These Mycenaean caches, incorporating a range of complete and broken items, are traditionally considered recyclable scrap, but they need not be random accumulations. The repetitive tool grouping suggests a structural principle in hoard formations, perhaps dictated by the state. The Mycenaean assemblages from the late 13th or early 12th century B.C.E. highlighted here may represent either palatial stock within a citadel or an archaeological remnant of a metal ta-ra-si-ja allotment given to a smith. The identification of several hoards as metal disbursements from a palace complements the picture of Pylian administration of metal, attested only by the ta-ra-si-ja arrangements outlined in the Jn and Ja Linear B tablets.